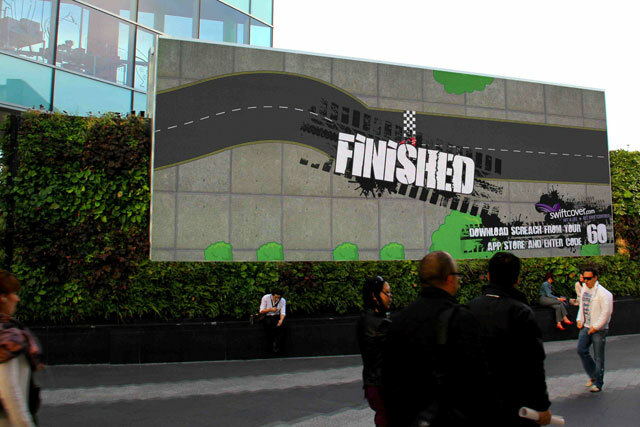 Swiftcover.com is offering visitors to Westfield London in White City the chance to compete in an interactive, motion-controlled race on Ocean Outdoor's large format digital screen, from tomorrow. As part of an interactive campaign, booked through Spark, drivers will be able to race against each other using their smartphone and the Screach app from interactive technology start-up Screenreach. Players can choose from a range of car models and colours to create a vehicle which can be raced along a simulation of America's Route 66 and collect Swiftcover.com tokens along the way. To play, gamers must download the Screach app and enter the "60" code onto the keypad. Players can then use their handset to steer the car on the big screen. Gamers who connect to the app through Facebook will have their profile image projected onto the digital screen and will also be able to post news from the game onto their page. Amanda Edwards, senior marketing manager at swiftcover.com, said: "Once again, Swiftcover breaks with traditional forms of insurance advertising. "This campaign allows us to interact nicely with our target audience, albeit in a very different environment and using a game format which absolutely resonates with the sentiments of the Get a Life campaign." Ocean Outdoor won the £70m 10-year contract for outdoor advertising outside the Westfield shopping centre in London's White City after a competitive pitch ahead of the centre’s launch in October 2008. Tim Bleakley, chief executive of Ocean Outdoor, said: "This imaginative and highly relevant outdoor campaign shows how well digital out of home advertising harnesses edgy technologies and clever content to deliver something a little bit different."